the content of your store. 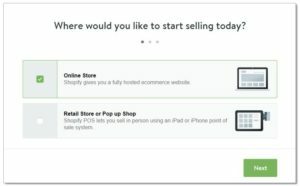 What is the difference between marketplace and Shopify.com? 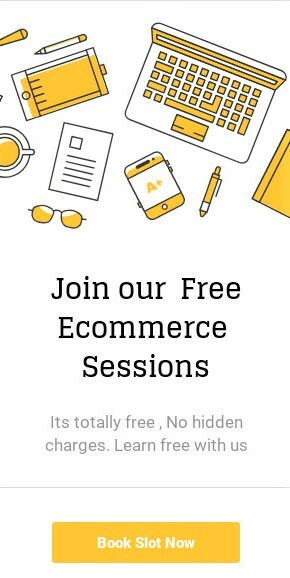 ecommerce platform that helps to create, design, and manage websites. 1. Go to Shopify.com Seller Page. Online Store: Create a fully hosted website to sell anything. 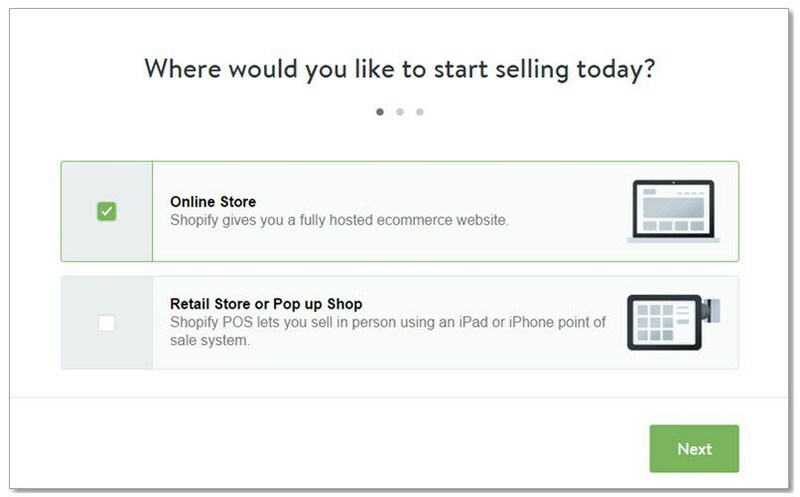 Retail Store or Pop up Shop:Open a Point of Sale using mobile devices, as an add-on to an existing retail website. Whether you made a sale online, in-store, or on your phone, your inventory is automatically updated in real time. 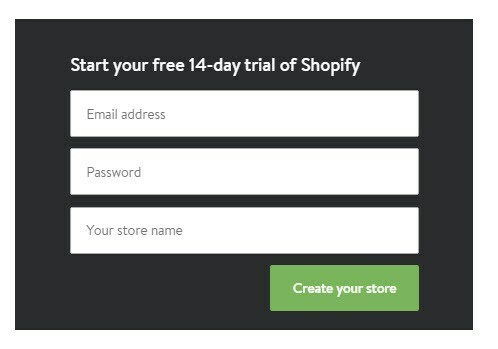 Basic Shopify: Start selling your products on your secure and beautiful online store. 2 Staff accounts. • Shopify: Get more sales with features like gift cards, professional reports, fraud analysis tools, and abandoned cart recovery. 5 Staff accounts. 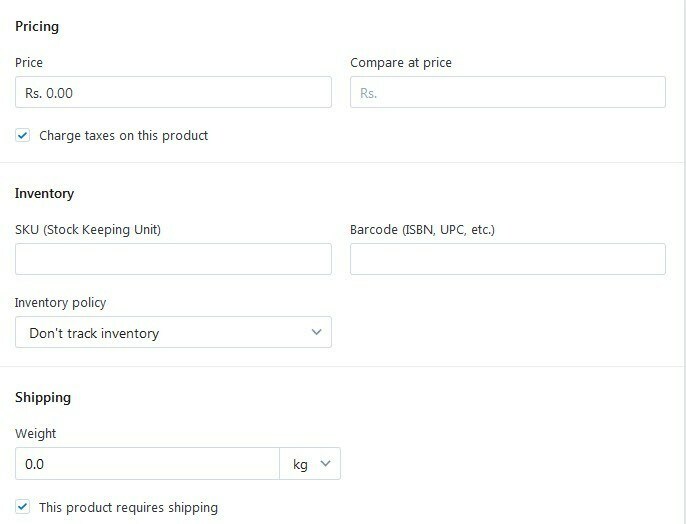 • Advanced Shopify: Save time and money with advanced report builder and carrier calculated shipping. 5 Staff accounts. After successfully setup of the store, you now need to start managing your store or website. Using Products menus, you can add a product on shopify by clicking on Add product button and you also export and Import the listing file. Add Product: You can add some products manually by clicking on “Add Product”. 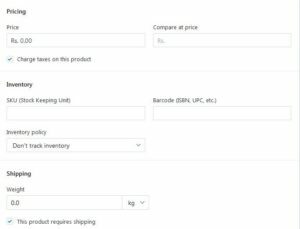 Import: You can upload products in bulk through CSV file. You need fill some product information like title, description, images, shipping weight etc. Now, we are going to describe all the mandatory fill that you have need to fill. Title: In this field you need fill the product name. Description: In this field you need to fill your full description according to your product. 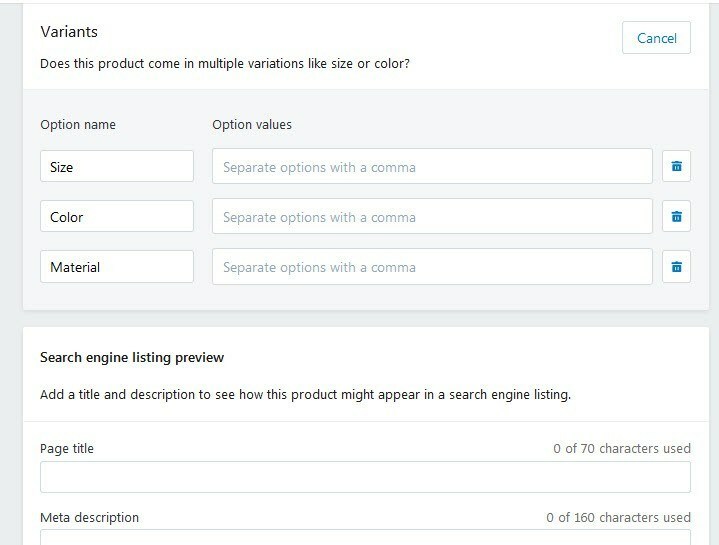 Images: In this fill you need to upload your product images. 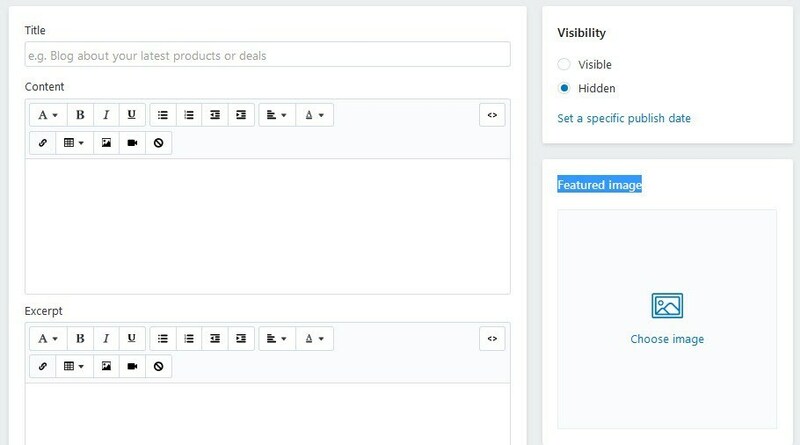 Visibility: Mark on “Online store” for showing product on live site otherwise unmarked. Organization:In this section you need to select or add product organization type like women shoes, men shoes, book, etc. Vendor: In this field you can select manufacture, brand and Also you can add new vendor if you needed. Price: Here you need to fill product price. Inventory: Here you need to fill SKU (Stock Keeping Unit), Inventory policy and Barcode (ISBN, UPC, etc.). Shipping: In this field you need to fill shipping weight. 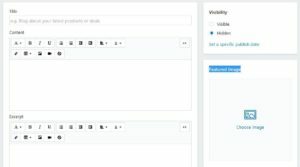 Add Variants: This section you need to fill attributes of multiple variations of your products like, size, color, and Material. 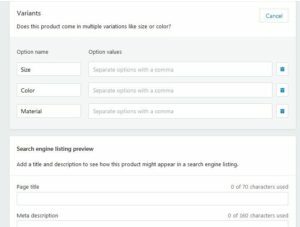 Search Engine: in this section add a title and description to see how this product might appear in a search engine listing like Page title, Meta description, and URL and handle. If you field all the field according to your product then you can click on “Save Product” for add product in catalogue otherwise click on “Cancel” button. In this section you can add, set, and update existing products stock quality. Collections: Collections in available under products menu. (Products/Collections). In this section you can add collections and updated collections. If you want to add new collection then click on the “Add Collection” button. For Example: Women shoes, Men Shoes, Women Clothing, Men Clothing etc. Reports Menu: Collections in available under products menu. (Products/Collections). In this section you can fetch the details of Product sales, Order sales, Payments method, Taxes, Traffic, and Website cart analysis. Also you can add report by clicking on “Add report” button. Discount Menu: In this menu you create a discount and increase sales. Offering discounts, coupons, and sales can be a vital marketing strategy for your store. You can Generate Discount code. Like (AV59HNK6YHES). There are many sub menu in the store menu. Now we are going to describe every sub-menu only by only. Overview-Submenu you can review overview of you website or store. Like your account plan type, lock and unlock store. Blog Posts Sub-menu: Using this Blog Posts Sub-menu you create blog post because. 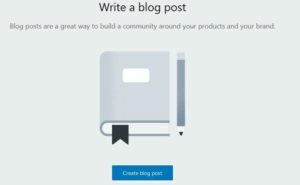 Blog posts are a great way to build a community around your products and your brand. After clicking on “Create Blog Post” you need to fill some fields. Like Title, Content, Excerpt and Featured Image. Pages sub-menu If you want to add or deleted pages in your website then you need to click on pages sub-menu. For adding new page you have to click on “Add Page” button. For deleting page you need to select the page and click on bulk actions and after this click on delete. Theme sub-menu: using this menu you can customize your website look using different theme. You can customize then existing them by clicking on the “Customize Theme” button. Also you can do live you them after customization and uploading new theme for this you need to click on publish theme. Navigation Sub-menu: Using this sub-menu you can manage website navigation menu or sub-menu. 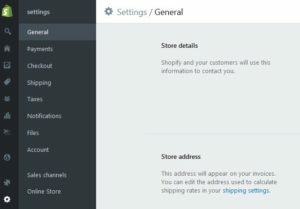 Also you can create drop-down menu for your online store. 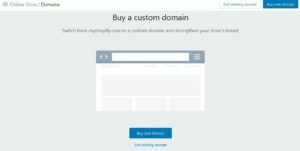 Domain Sub-menu:Using the sub menu you can buy custom domain. For Custom domain click on “Buy New Domain” button. Also you can add existing domain. Setting Menu: Using this menu you can update general account information. Payment getaway, Checkout, Shipping, Taxes, Account, Sales channels, and many other. If you want to change general account option like Store name, Account email, Customer email, Legal name of business, Phone, Street, City, Country and State. Payments: Payments sub-menu is available under setting menu. 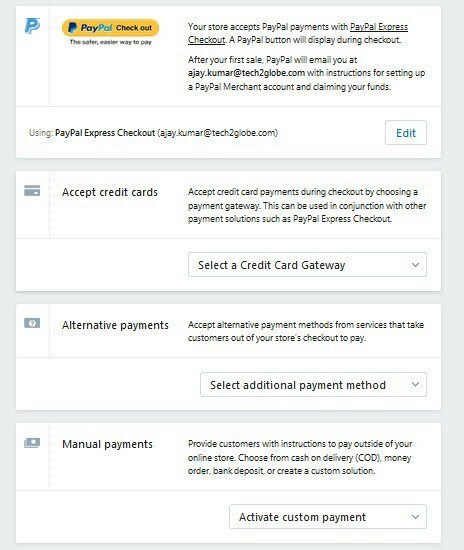 You can manage Payment method using this sub-menu. Note: Enable payment gateways to accept credit cards, PayPal, and other payment methods during checkout. 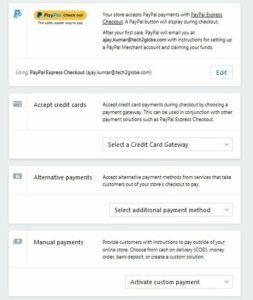 PayPal: Your store accepts PayPal payments with PayPal Express Checkout. 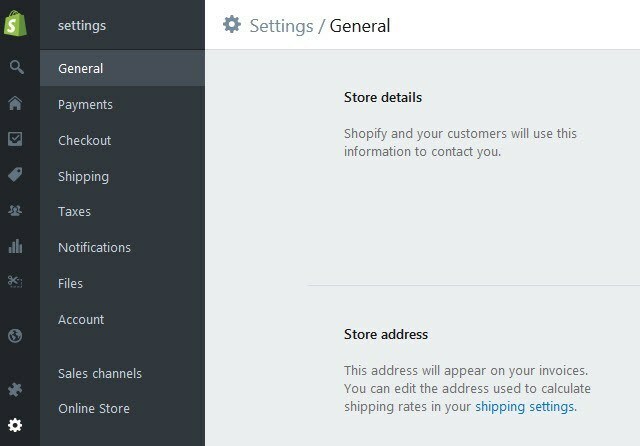 A PayPal button will display during checkout. After your first sale, PayPal will email you at with instructions for setting up a PayPal Merchant account and claiming your funds. Accept credit cards: Accept credit card payments during checkout by choosing a payment gateway. This can be used in conjunction with other payment solutions such as PayPal Express Checkout. Alternative payments: Accept alternative payment methods from services that take customers out of your store’s checkout to pay. Manual payments: Provide customers with instructions to pay outside of your online store. Choose from cash on delivery (COD), money order, bank deposit, or create a custom solution.